Mile-High Salute to my Broncos, baby! 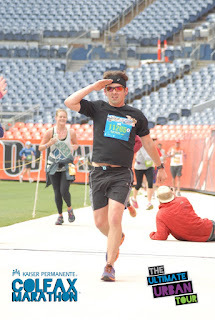 On May 15th I ran the Colfax Marathon. It was my first time running the entire course, having done the first leg of the marathon relay in 2015. You can view my specifics on Strava here. I got to Denver City Park at about 4:45 AM to find parking. I'm glad I arrived as early as I did, because the lots were already starting to fill up. But with a starting line with thousands of participants, I suppose you have to expect some parking difficulties, right? The weather was super agreeable; about 45 degrees at the start with no real wind to speak of. The entire morning never got above 55 degrees, which made for incredibly pleasant running. I had a cheap sweatshirt that I wore to stay warm before the start, but I tossed it before we even began. I rant the first few miles at a comfortable 8:25/mi. Looking back, it may have been prudent to go a bit slower out of the gate, but that early race adrenaline had me pretty amped. By mile 9, a lingering glute strain began to bother me a little, but it wasn't anything painful, so I was able to work my way through it by the end of the Sloan's Lake leg of the course. Miles 12-15 climbed about 200 ft, which looking back isn't that much, but it certainly felt like a challenge at the time. I remember thinking, "Dammit, go away hills!" Again, looking back, I probably should have gone up the hills a little bit slower to save some gas in the tank for the last few miles, but I knew that miles 17-20 were nicknamed the "Screaming Downhill" leg, so I figured I'd make up some time there. But I was wrong. My body just didn't want to scream down the hill by that point. I managed to maintain an average pace of about 8:27/mile on the downhill, but if you adjust that based on the grade %, the numbers tell you what my body was saying: "Fuuuuugh..."
And then mile 21 hit and I experienced the sudden slow-down that I usually suffer at that point in marathons. It's like clockwork. I watched my pace drop off like a rock. 8:27 became 9:00. Then 9:05. Then 9:21. I watched the 3:45 pacer run past me near 23.5 miles and there wasn't much I could do about it. By the time I crossed the finish, I was struggling to run a 10:07/mi pace. My final time was officially 03:46:14, which breaks down to a pace of 8:37/mi. It was slower than I had been hoping to run, but it was hard to be too disappointed. And my recovery time was quicker than it's ever been, so I'll take that as a huge victory. Next up: Chicago Marathon in October. A pancake-flat course near sea-level.